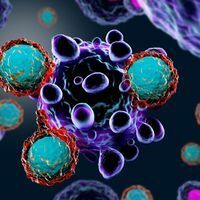 Last April, Merck and Incyte released the discouraging results of a large Phase 3 clinical study testing the combination of two immunotherapies—a promising IDO1 inhibitor and an anti-PD-1 checkpoint blockade therapy—in patients with advanced melanoma. Researchers have shown the anti-PD-1 drug, which blocks a critical inhibitory signal on T cells, to be successful at treating a growing list of cancer types, including melanoma, lung, and bladder. The IDO1 inhibitor targets an enzyme in a metabolic pathway that was shown in preclinical studies to regulate immune function and promote cancer immune escape. But the combination treatment showed no improved benefit over anti-PD-1 therapy on its own. Due to this disappointing finding, several companies with multibillion-dollar investments scaled back efforts in IDO1-based immunotherapy or decided to halt such efforts altogether, and many started to question the enzyme’s potential as a therapeutic target. But rather than turn our backs on IDO1 without further inquiry, the field would benefit from studies aimed at understanding what went wrong. While immunotherapy success stories are inspiring for many battling this deadly disease, they are still the minority. Immunotherapy has proven to be a game changer in the treatment of cancer. Recent breakthroughs in the field have placed it as one of the pillars of cancer care, together with the traditional approaches of surgery, chemotherapy, targeted oncogene pathway inhibition, and radiation therapy. In some cases, cancer patients receiving an immune-targeting treatment appear to be “cured”—the most taboo word in oncology. But while success stories are inspiring for many battling this deadly disease, they are still the minority. Much progress is still needed to make the success of immunotherapy more widespread across patients and cancer types. Like other examples, IDO1 inhibitors might have been moved to clinical trials too fast, when not enough was known about which patients were most likely to benefit. Recent research has uncovered clues underlying many patients’ lack of response to immunotherapeutic agents, though by and large the mechanisms underlying immunotherapy resistance are still unclear. Immunotherapy should not be seen as a “one-size-fits-all” modality. Knowing which patients to treat with which agents will be critical for the approval of new immunotherapies, and the identification of immunotherapy biomarkers is needed to identify those patients. For instance, in its trial with anti-PD-1 agent pembrolizumab, Merck decided to enroll patients whose tumors expressed PD-L1 in at least 50 percent of their cells; this was likely critical for the positive findings and the drug’s approval for first-line use in advanced non–small cell lung cancer (NSCLC). 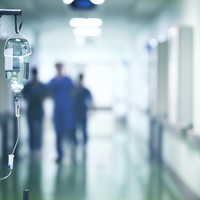 Bristol-Myers Squibb conducted a similar trial with its anti-PD-1 drug nivolumab using a much lower cutoff, and the treatment did not delay progression or improve survival among trial participants. In 2017, Merck—for whom I am a paid consultant—received additional approval for pembrolizumab’s use in patients carrying a specific genetic feature or biomarker (mismatch deficiency or microsatellite instability), regardless of cancer type. An emerging concept in the field of immuno-oncology is that the more DNA mutations a tumor has, the higher the likelihood it will be recognized by the immune system as foreign. Mismatch-deficient tumors, which harbor defects in DNA-repair genes, carry more DNA mutations and tend to respond well to immune checkpoint blockade therapy. The unprecedented FDA approval of an anticancer therapy based on a genetic feature and not on the organ in which the cancer originated highlights the potential of biomarker identification. Other groups are currently assessing tumor mutational burden (TMB) as a means to identify which patients are more likely to benefit from immune checkpoint blockade therapy. Matthew Hellmann, a medical oncologist at Memorial Sloan Kettering Cancer Center (MSKCC), led two recent studies that describe high TMB as the strongest feature associated with improved clinical outcome in advanced NSCLC as well as small-cell lung cancer (SCLC) patients treated with an anti-PD-1 drug plus another checkpoint blockade agent that inhibits the receptor CTLA-4. Similar findings suggest that TMB can be a powerful predictor of immunotherapy response in other cancer types, including melanoma and urothelial cancer. Apart from the discovery of biomarkers and novel therapeutic targets, optimizing combination therapy regimens will require consideration of the timing and sequence of the drugs’ administration. 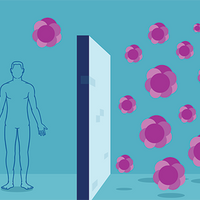 Immune cells themselves can serve as biomarkers for identifying responsive patient populations. For example, recent preclinical work—led by Jedd Wolchok and Taha Merghoub from my current lab at MSKCC—and others have shown that PI3Kγ inhibitors work selectively in tumors with high levels of infiltration by myeloid cells such as tumor-associated macrophages and myeloid-derived suppressor cells, which play a role in immunotherapy resistance. A recent publication in Cancer Cell revealed that monitoring a new subset of immunosuppressive T cells in the peripheral blood of patients during anti-PD-1 and anti-CTLA-4 therapy can inform dosing and improve immunotherapy efficacy. Researchers have also begun to uncover features of the gut microbiome that correlate with immunotherapy response. For example, a 2015 study linked an abundance of the Bacteroides species in the gut with improved response to anti-CTLA-4 therapy, while a study published earlier this year linked the Ruminococcaceae family of bacteria with response to anti-PD-1/PD-L1 in melanoma patients. The discovery of biomarkers for immunotherapy responses could not only help researchers identify patients who are likely to benefit, but also those likely to suffer from side effects, which are frequent and can even be fatal. 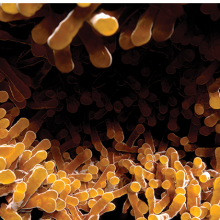 In 2016, for example, Wolchok and colleagues found that metastatic melanoma patients who had more intestinal Bacteroidetes bacteria were at a greater risk of developing colitis following anti-CTLA-4 therapy. Also, several studies show a correlation between side effects and increased efficacy of immunotherapy. Thus, scientific efforts aimed at uncoupling therapeutic effects from immunotherapy-related adverse events are urgently needed. In addition to the low response rates seen in some clinical trials of novel immunotherapies and combos, a few patients have actually fared worse on these treatment regimens. A recent trial using anti-PD-1 for adult T-cell leukemia-lymphoma (ATLL) showed that patients progressed more quickly after therapy. In 2017, researchers published in Nature that PD-1 worked as a tumor suppressor for T-cell lymphoma in a mouse model, providing a potential explanation for such clinical findings. Another example of checkpoint blockade immunotherapies causing cancers to grow quickly soon after treatment begins is an unusual phenomenon known as hyperprogressive disease (HPD). HPD has now been described across different solid tumor types upon PD-1/PD-L1 pathway blockade. It’s still unclear whether immune checkpoint blockade therapy plays a causal role in the condition, which affected less than 10 percent of anti-PD-1/PD-L1 recipients in a 2017 study. Recent genomic analysis has linked HPD with amplification of the MDM2 gene family, which encode proteins that inhibit the tumor suppressor p53, and with EGFR aberrations, which affect a signaling pathway activated in multiple cancers. These findings can potentially help in identifying those patients predisposed to develop this condition. In a field full of questions and few definitive answers, the key for success will most likely be the development of rationally designed therapies, which take into account the particular features of each tumor. Knowing how to combine immunotherapy drugs with one another, as well as with most traditional agents, including radiation, chemotherapy, and other targeted therapies, is an area of high demand given its synergistic potential. Apart from the discovery of biomarkers and novel therapeutic targets, optimizing combination therapy regimens will require consideration of the timing and sequence of the drugs’ administration—factors that have been shown to be critical for efficacy and safety. For instance, potent antitumor immunity with CSF-1/CSF-1R inhibition, which targets suppressive myeloid cells, is only achieved when given after or concurrent with an anti-CTLA-4 checkpoint blockade agent. Similarly, sequential combination of an agonist for the T-cell costimulatory agent OX40 followed by anti-PD-1 resulted in significant increases in therapeutic efficacy, but not so when researchers administered the therapies in the reverse order. While the promise of immunotherapy is real and success seems inevitable, it is still important to consider factors that currently limit the approach’s effectiveness. Failure is a natural part of the scientific process and should not come as surprise in such a fast-evolving field. Disappointingly, there are currently few incentives to publish negative data. Therefore, results from failed immunotherapy trials are not frequently published, which can make it more difficult for scientists to learn from past mistakes. Instead, these failures should be treated as opportunities for improvement. Only through further investment in basic science and by understanding how these drugs work—and don’t work—will immunotherapy reach its full potential. Luis Felipe Campesato is a postdoctoral fellow in the Ludwig Collaborative and Swim Across America Laboratory at Memorial Sloan Kettering Cancer Center and is a consultant/advisory board member for Merck.